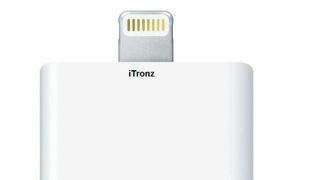 Want an Apple Lightning-to-30-pin adapter but don't want to drop $29 (£18) on one? Starting Monday, you don't have to. Amazon has put pre-orders for legacy device-enhancing adapters made by third parties on its site, offering them up for $9.99 (about £6) and $17.95 (about £11). Two companies - Nanotch and iTronz - are schilling the products, with the latter, selling the $10 version, promising to ship it by next week. Apple's adapters are "available to ship" in October. Thanks to an erroneous message, customers thought they'd get a free adapter with the purchase of an iPhone 5. However, Apple quickly pulled the message and reminded customers that they would indeed have to fork over some dough for the dock adapter. In other Apple/Amazon news, Amazon has begun taking pre-orders for Apple's new iPod line - the reinvented iPod nano, iPod touch, and cheaper iPod shuffle. Apple won't start shipping the new iPods until October, so it's unlikely Amazon will stray from the launch plan. There also appears to be no change on the price front, either. The iPod touch and iPod nano both need the slimmer Lightning cable to charge and connect. TechRadar reached out to Apple for comment on its policy towards third-party product manufacturers and will update this story if and when information is available.